Last month was manic and I’m afraid life got in the way of baking and blogging so there was no Bake It! recipe – apologies to those who missed it. 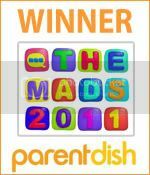 It also means I didn’t get to announce the prize winner from January’s recipe, which didn’t seem to be very popular as there were only two entries – *sob*! So the random generator picked Frugalicious Food – please can you send me an address to post the book to (email address is in the sidebar)? 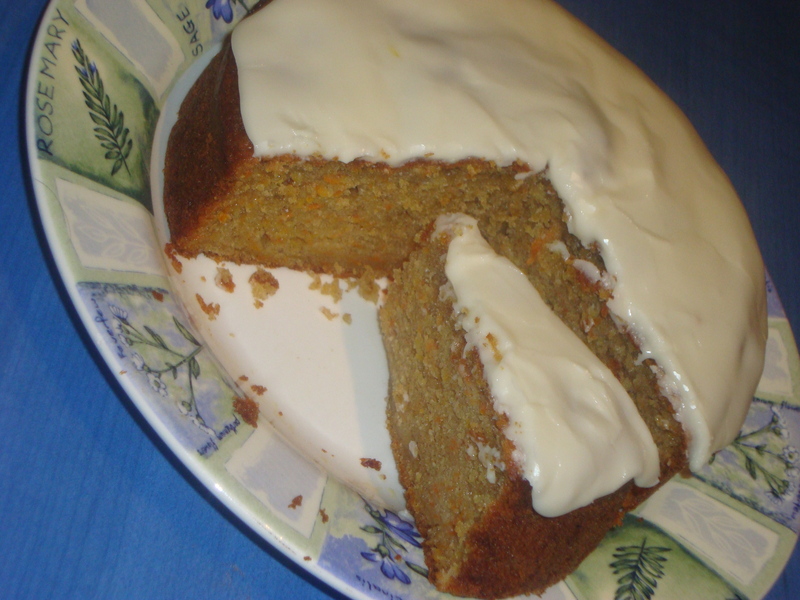 This month I wanted to bake a cake using simple ingredients that I already had in the house so I opted for a carrot and orange cake with orange icing. This is a moist, dense cake that is almost like a pudding in texture – definitely one to eat with a fork! I added a simple orange glacé icing but it would work really well with a cream cheese frosting too. Make sure you prepare the ingredients (grating etc) before starting the recipe as you need to mix the wet and dry ingredients together and get them in the oven quickly. 1. Preheat the oven to 150°C and line a 7 inch (18cm) round cake tin. A loose bottomed tin is best as it makes it easier to remove the cake, but any lined tin will be fine. 2. Sift the flour, baking powder and cinnamon into a large bowl or the bowl of your food mixer. Add the sugar and stir to combine, breaking down any large lumps of sugar. 3. In a separate jug, mix together the eggs and oil. 4. Add the orange juice to the dry ingredients then gradually stir in the oil and egg mixture until it is all combined. 5. Add the orange rind and grated carrot to the cake mixture and stir until it is evenly distributed. 6. Pour the cake batter into the prepared tin and bake in the centre of the oven for 1 hour – 1 1/4 hours until the cake is firm and a skewer inserted into the centre comes out clean. 7. Leave to cool in the tin for 20 -30 minutes then turn out onto a wire rack to cool completely. 8. To make the icing, sift the icing sugar into a bowl and gradually add the juice of half an orange. If the icing is still too stiff to spread add some cold water, a few drops at a time. 9. Spread the icing over the top of the cake and leave to set. Unfortunately, the linky tool I used to use is no longer free and I am too tight to pay for it so we will have to do things a little differently from now on! If you join in and bake the recipe can you either leave a link in the comments to your blog post or email me a link and I will put together a round-up of everyone’s links at the end of the month. Deadline for submissions will be 8pm on Monday 28th March and I will put together the round-up post the next day. Sorry this is a bit long-winded but I can’t think of a better way to get round it. As always, please add photos of your yummy baking to the Flickr group and grab yourself a blog badge if you’d like. Sorry there is no prize this month as I am still looking for sponsors. If you know anyone who might like to donate a small prize one month, please send them my way. Oh yum, can’t wait to make this!!! 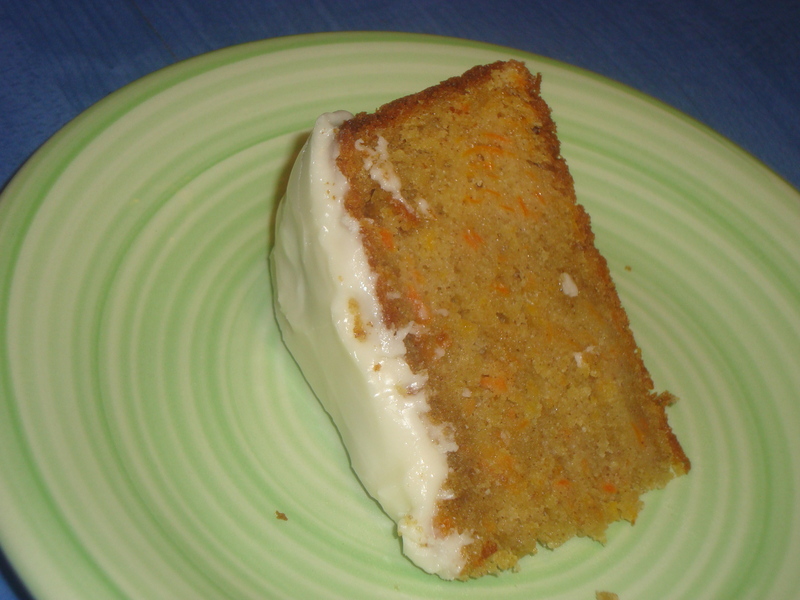 Never made a carrot cake before, though I do love them! Always wanted to try to make carrot cake, I’ll be up for this one. Have you looked at free text links from http://www.inlinkz.com Seems to work fine, free unless you want to display thumbnails. Will have a go at this the weekend and get my daughter to help as well. Looks yummy! We use lemon not orange for the icing, also almond flour (self ground)!